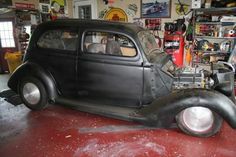 1937 FORD SLANTBACK This all steel 1937 Ford Slant back was professionally built in Canada. It features a small block Chevy 400 (.040.) 4 barrel, HEI ignition, Electric Cooling Fanw/Thermostat, Block Hugger headers, Stainless Steel Dual Exhaust, 5-Speed manual transmission, hydraulic clutch, Ford 9\' w/3.90 gears. All controlled with you and power rack & pinion steering! The frame is a custom double tube mild steel frame with Heidts Mustang II Complete Front Suspension Kit, Rear Leaf springs, gas shocks, power disc brakes with rear drums. The Vintage air and heat work awesome! The interior features Power Windows, Tilt Steering wheel, Grant Steering Wheel, VDO Gauges, Electric wipers, Dual Reclining front Bucket Seats, Rear Bucket Seats with tons of leg room!!! Other Features are: AM/FM/CD Stereo w/6 Speakers! Mag Wheels 15x6 front, 15x8 rear on BFG Radial Tires! EZ 21 Circuit wiring throughout, Third Brake light.